I was inspired to write this book based off of my own personal experience. 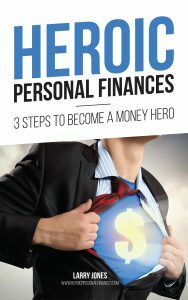 I used the knowledge I share in this book to pay off over $130,000 worth of debt and move from a net worth of $-40,000 to over +$240,000 today. We live in a time in our history when real wages are either stagnant or declining for the average person. Over the last two decades, the incomes of both the middle and lower classes have either stayed steady with inflation or dropped behind it. For most of the 20th century, it was possible for a family to survive and thrive on one income. The 21st century has been a different story. With increasing inflation, especially in the area of healthcare costs, more and more families have been forced into a new paradigm. Either both parents need to work full-time jobs, or a combination of different jobs to survive and thrive with their finances. There are a variety of reasons why real income for the lower and middle classes has fallen off over the last few decades. Because we live in such a polarized political climate, the wealthy take the brunt of the attack for much of the financial challenges of today. Yes, the upper class have gotten richer while the middle and lower classes have gotten poorer. But, I do not believe this is due to the wealthy going out and stealing money from poor people. Sure, there are a few cases of evil rich white guys doing illegal stuff that is taking people for a ride. For the most part, though, the rich are getting richer because they know how to create more money. Gasp! Larry, please say it isn’t so. I thought the money fairy and evil white guys were colluding together to take everybody else’s money away! The reality is this: wealthy people know how to generate more and more income. This knowledge is how they got wealthy in the first place. The more money you bring in allows you to send it back out in investing and business creation to generate even more money. At the end of the day, it’s not that complicated. But, it does take time, knowledge, and application of that knowledge to get to that next level of wealth. Wealthy people also know how to shield and protect large portions of their income from the government. As a percentage, they pay less in taxes than most. This tax savings, of course, irritates many on one side of the political spectrum. In my opinion, the media and politicians would be better off to quit demonizing all wealthy people. Instead, I believe we should praise them for their insight, knowledge, and resourcefulness. We should interview them on how they have achieved what they have achieved. We should copy them on how to go to the next level in our finances. The reality is that there are already millions of books, classes, podcasts, and videos available out there today that show people how to handle money. They teach us how to generate more income, how to save money, how to spend money, and how to invest money. We have a fire hose of information available on our smart phones, 24 hours a day, seven days a week. The responsibility is ours to get off the Twitter machine and Fakebook and dig into a storehouse of wealth knowledge that is already at our fingertips. If you want to be wealthy over the long haul, then you have to focus on the front end. You have to figure out how to generate money. You have to figure out how to invest more money that will make more money. And, you also have to control the money that’s going out the back door on spending and taxes.